Does the image above look like lunch to you? 1. Sugar - The sugar content at 37 grams is almost the same as a 12 ounce can of Coke. We can learn a lot from Oscar Mayer's growing sales and lunchable product line. Why are these so attractive to children? Children taste with their eyes - see DIY Packaging Tricks For Healthy Snacks. There are a ton of different lunch boxes out there with little cute shapes to put food in. I found a list with literally hundreds of ideas to make Lunchables look truly sad. Check out: 20 Days of Healthy, Wholesome School Lunches - these work for adults, too! 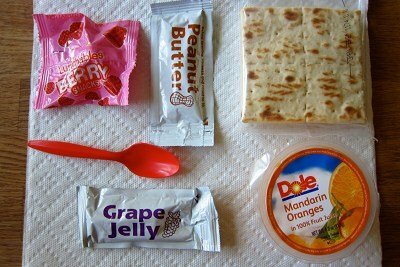 And here is my list of lunch box snacks: Top Ten Lunch Box Snacks 2011. Please share your thoughts on Lunchables. My daughter saw those the other day in the store and wanted them. They happened to be on sale 2 for 5...still ridiculous. I think my homemade PBJ is cheaper, healthier, and definitely more tasty. She also had a thing for those frozen PBJ things by Smuckers which are even worse. My kids are always asking for these. For the life of me I can't understand what the appeal is. The cost is to much. My kids eat like horses, their is no way that amount of food will be enough for them. And do they really even taste good, cold pizza you make yourself...yuck! Haha I'm such a kid at heart- the idea of it even got me excited! Although if I'm going to eat 'crap', it wouldn't be in the form of pb&j....that's like the easiest, cheapest meal to whip up, what's the need to buy it from out, processed and all?? My kids ask for a 'snack lunch' which was the term I used for cheese and crackers and other finger foods when they were tiny. These days I have reusable small plastic containers for their lunch boxes, with thermoses for beverages. So today, they wanted crackers and cheese, dried cherries (we buy them in bulk), and a sweet pepper from the garden (raw), with their regular milk. The cheese may not be the greatest--one wanted cheese slices that come wrapped in plastic, and the other wanted slices from a cheese/prosciutto/basil log I had picked up for fun. Sometimes we have peanut butter for the crackers, or a little honey with apple slices..the little containers make it very easy to make up what they want to eat in the morning. I think this is better than what comes premade in a box, shelf stable, even if we are still doing processed cheese food slices.. I am especially grateful that my kids will eat raw vegetables like bell peppers and other sweet peppers from the garden. And we made a requirement for their lunches early on that every lunch must have a vegetable, a fruit, a drink, and a 'main'.. Now and then my son asks for (frozen) corn for his lunch instead of a raw veg. So far this year they are eating everything I pack. And it definitely doesn't cost me $3 per lunch! I was surprised when they wanted to take their lunches instead of eating a hot lunch at school, but they realized very quickly that the hot lunch line takes longer to get through, and they can be eating earlier if they take a lunch box. I coupon to make our food dollar stretch further. And these guys you can get close to free when you combine coupons with a sale. I still won't buy them. That being said, the comment that kids eat with their eyes is so scary but true. My 2 year old, who's never had candy (at least in my house), is automatically attracted to the candy in stores. It's kind of scary. A peanut butter and jelly sandwich takes what - maybe 90 seconds to make? Whyyyy? The sad fact is that I see lots of adults at my job eating Lunchables as their lunch meal. Go figure? It's easy to see why the kids like them. Their parents have the tastes of an 8 year old and indulge them because they "taste good" and "I don't think 'they' would feed us something bad." Ignorance of food and what it does to the body is passed along from parent to child. I showed this to my 5 year old who is just now getting used to eating Peanut Butter sandwiches- no jelly! and he just looked at me with disgust. He is so picky that any new food he decides to try I instantly take joy in. He ate a carrot stick a few weeks ago because he saw the guinea pigs we were babysitting eat them. Now he thinks they're awful again. There's kids at my daughter's school that always has this kind of stuff. She thought the pizza one was cool cause you do it yourself so I got her one last year for a treat. Her sister is home with me and had one too and hated the taste and my other daughter said it was good but has never asked for it since. I try to make their lunches exciting but sometimes it's hard to compete with marketing :) Taste always wins in the end though!! glad I've never seen any of these. Charlotte- I notice people collecting these because of coupons. I agree with you, I don't care if an unhealthy food is free, I am not feeding it to my kids. A treat is a treat but this is supposed to be lunch! 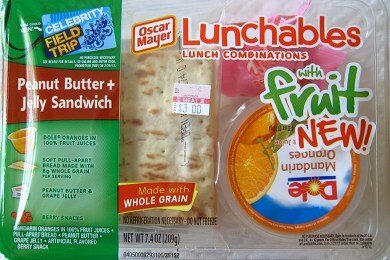 Not sure about the PB&J one shown here, but the sodium found in most Lunchables is awful. Flip over the package on any of them and look at the sodium and it will rock your world. Yikes. Me and my easylunchboxes.com (found because of you, SG!) are the only way to go to pack a great lunch for my kids. I make up a week's worth of meals for each of them (and myself!) on Sunday nights so I can grab and go each day we go to school/prek/part time job. I also fill them with supper's leftovers when I cook so we can eat "tv dinners" one night each week and have a family "movie night" and this Mom doesn't have to cook. Gotta love it! Woo hoo! Personally, I know a lot of good moms who also choose to have careers--but they don't try to be "supermom" and cheat their children of real food, cooking, etc. My suggestion to every mom out there is HIRE A CLEANING LADY. If someone comes in a couple times a week to do your house and laundry, you can spend more quality time with the kids and do things like cook, without feeling exhausted. That's why they're just about giving them away to kids...It preps their minds and their tastebuds for their other unhealthy items. Some adults don't delve into ingredients, etc. They just read the label that says "whole wheat" or "heart healthy" and automatically figure they've done their nutritional duty to themselves and their children. I'm 12 and avoid all of that! Plus the price isn't good for the wallet either. Besides, I can make this at home for 1. much cheaper, 2. much healthier, and 3. It takes longer to hop in a car and drive to a store to buy this. Just wondering - why was this in the shampoo isle? I would think that would be a health violation.